The Stop Girl has seen what you’re saying, and she finds it a bit unsettling. 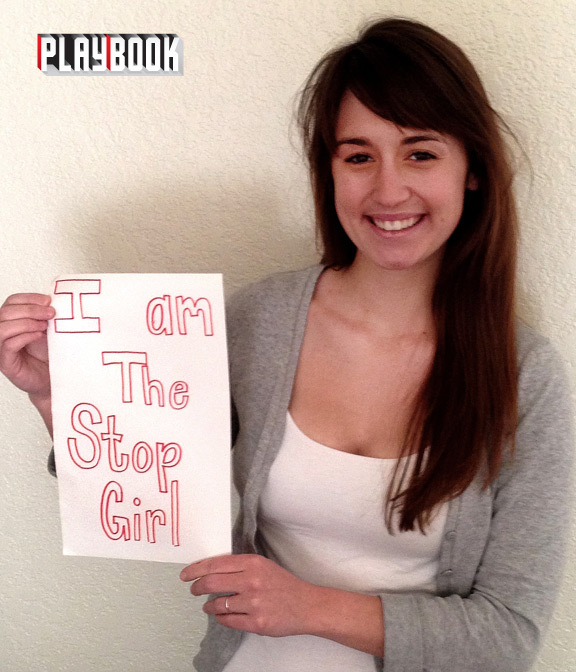 The Stop Girl is Sarah. She doesn’t want to give you her last name, even though she knows “people are crafty,” and will probably sort it out. But you can’t blame her for being a little uneasy. She went to a game and left as a meme. For the uninitiated, Sarah has become an unlikely, mysterious star on the Internet through no fault of her own. On Sept. 18, 2010, while attending the University of Arizona, she went to watch her Wildcats play against Iowa. An early Arizona lead unraveled, and Iowa tied the game, 27-27, in the fourth quarter. She was not pleased at this development. To add to her misery, a rowdy student section had been playing to the cameras all game, so she leaned over the railing to get a little distance from her fellow fans. She saw an ESPN cameraman train his camera on her. Then, to her surprise, the red light came on. As the camera stayed fixed on her, she playfully implored the cameraman to stop, melting hearts in the process. There is a whole “subreddit” devoted to Sarah’s animated mood swing, with nearly 12,000 subscribers who do nothing more than post the GIF in response to titles like, “Dear North Korea.” The file has been uploaded many times across many services. But at least one has been viewed about 1.4 million times. She sees it all, even if she’s not sure what she thinks about it. She said it was a message board on which someone had used the photo as their signature on their posts. “Now, [two years later], it’s all over reddit, and it’s getting really popular,” she said. She speaks about it in a self-deprecating, aw-shucks manner that fits her seconds-long Internet image. Ryan Broderick, who created the list, said it’s the range of emotions displayed in the clip that make it so popular. that’s universal. It’s never been summed up in an animated GIF so well before. Sarah puts that to rest. Sarah obviously hasn’t tried to capitalize on the attention. She recently graduated from Arizona and is beginning her career. She said no one seems to have randomly recognized her in public, but she has heard from old friends who realized it was her. Broderick said the mystery has long been part of the appeal. “I do have a boyfriend,” she said.